I wanted to share this delicious gratin recipe I made last night. It was so good that I am eating this again for dinner tonight so I figured it was blog worthy. This gratin may seem a little far fetched when I list the ingredients but trust me the flavors really do come together so beautifully… it is a surprise to the palate. Last night I was at the market shopping for ingredients, and I was about to make the decision between either making a cauliflower gratin or a potato gratin…hmmm tough decision as they would both go so well with my steak. I sauntered around and grabbed some thyme, picked out some apples, walked by the squash section and realized how sad I was that butternut squash season is almost coming to an end. I looked in my basket at the apples and thyme and instantly Butternut Squash and Apple Gratin popped into my little head. I wanted something creamy and salty to top it with…Feta….ooh and Creme Fraiche. Done. Sometimes I surprise myself, and this recipe will now be in my repertoire for years to come. There are many things the french culture has taught me, however one lesson that I always take with me to the grocery store is simply buy produce in season. In other news, I hired a french tutor! I will go for a private lesson 1-2 times per week. I have made it my goal to become fluent in french…some day. You’ve got to start somewhere right?! 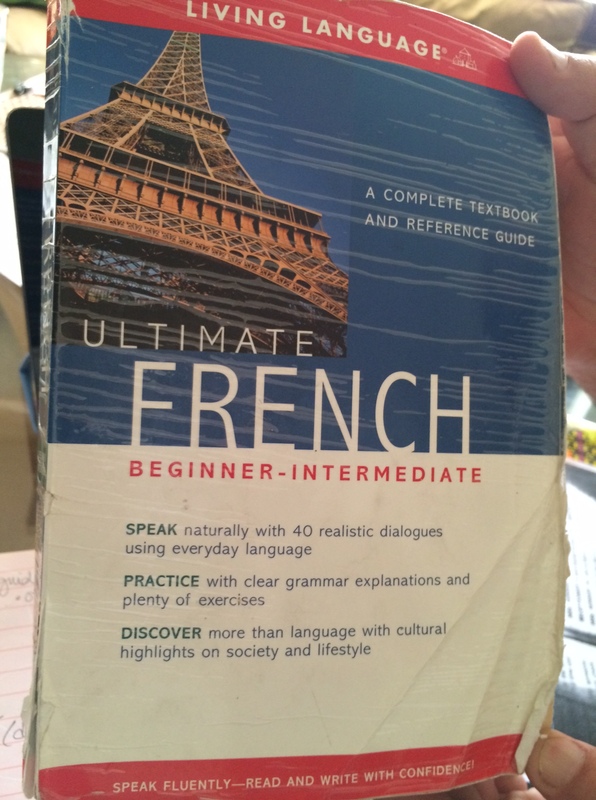 I had started french lessons when I was living in Austin. I had hired the most lovely quintessential french woman Sandrine to teach me, who is now a dear friend of mine…I now live in California so a new teacher it was. I will keep you posted! Gratin recipe below…This is also great for a vegetarian meal. In fact, tonight I will have this sans steak and add a nice green salad. Preheat oven to 350 degrees F. Butter a 9X13 baking dish (I just used a baking sheet) and add sliced apples and butternut squash. Dot with 1 tbsp butter and season to taste with salt and pepper. Place in the oven and bake for 20 minutes. Meanwhile in a medium bowl, combine creme fraiche and cinnamon. Set aside. Melt remaining tablespoon butter in a nonstick pan over medium heat and add the onion. Sauté 5-7 minutes until lightly caramelized. Salt and pepper to taste. 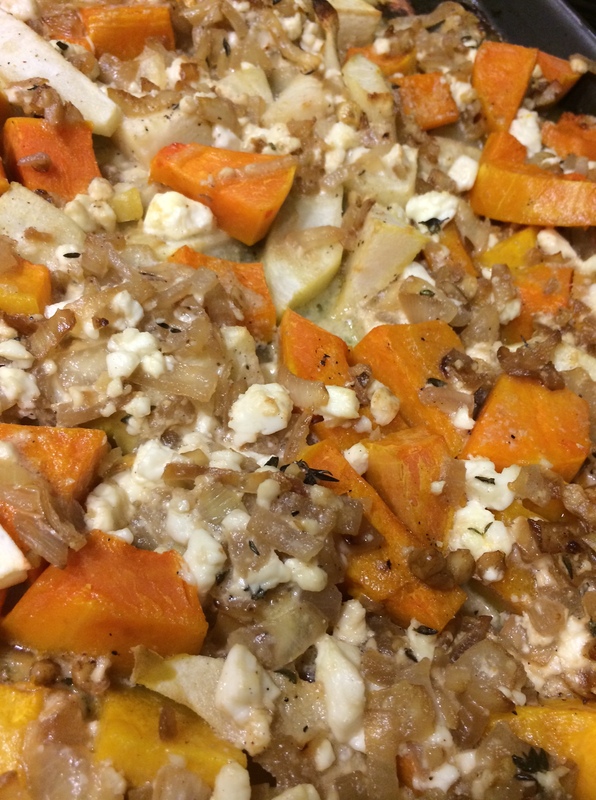 Remove from heat and add in walnuts, feta and thyme. Add the creme fraiche mixture and combine thoroughly. Pour mixture over the butternut squash and apples and return to the oven. Continue baking until the vegetables are tender and the top is golden 20-30 minutes. Remove from the oven and serve immediately. Garnish with additional thyme if desired. Bonjour Krista! This recipe looks really yummy and healthy. Thank you for mentioning to buy produce in season. It makes so much sense but of course I haven’t been paying attention but wiill do now! Yum! the recipe looks fabulous Krista! And I’m so excited that you are taking French lessons again. C’est Bon! Hello my friend! You are an inspiration..your passion, your creativity and your love of life!! I saved this blog reading until this morning so that I could really enjoy it. I love your emails!